In 10-inch nonstick skillet, melt 1 tablespoon of the butter over medium-high heat; add bread crumbs. Cook about 3 to 4 minutes, stirring occasionally, until bread crumbs are toasted; remove from skillet and set aside. Increase heat to high. In same skillet, melt 1 tablespoon butter. Cook chicken in butter about 6 minutes, stirring occasionally, until brown on outside and no longer pink in center. Remove from skillet and keep warm. Reduce heat to medium-high. In same skillet, melt remaining 1 tablespoon butter. 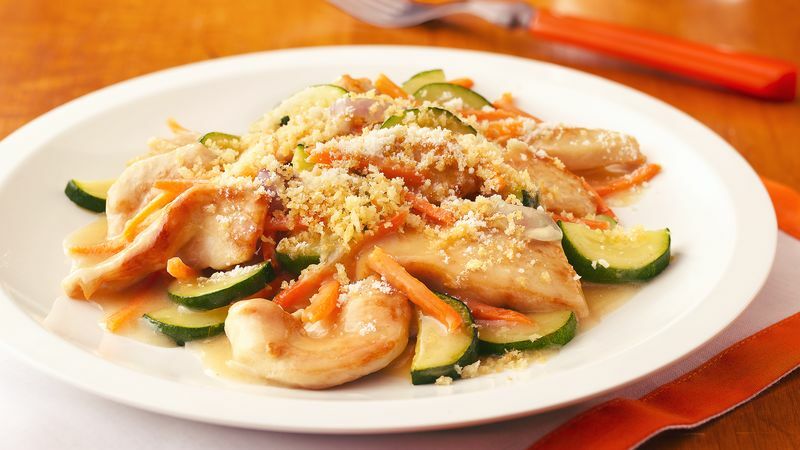 Cook shallots, zucchini, carrots and pepper in butter about 5 minutes, stirring occasionally, until crisp-tender. Sprinkle with flour; cook 1 minute, stirring constantly. Stir in broth and sherry. Heat to boiling; boil 1 minute, stirring frequently, until slightly thickened. Return chicken to skillet. Stir in half-and-half; heat just until hot. To serve, spoon chicken mixture into serving dish. Sprinkle with cheese and toasted bread crumbs. When shopping for zucchini, choose small zucchini. They tend to be more tender and have thinner skins. To reduce fat, you can use milk instead of half-and-half, or try fat-free half-and-half.